Yesterday Mr. Shankar Balan sent me this short story about his personal golf experiences last week in Bangkok. The full story will be published in next month’s Golfline Magzine, India. However, after reading the story, I fell in love with Shankar’s writing style and I immediately asked him if I could use it on the site. He graciously agreed and thus I decided to devote the next 4 days to the world’s first posting of the best parts Shankar’s story, another Thailandgolfzone exclusive! Recently a good friend and I were happily able to take a short Golfing holiday in the picturesque and tourist friendly Kingdom of Thailand. 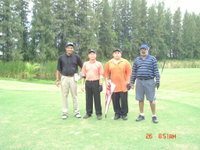 We had fixed up our Golf via the world-wide-web and I had zeroed in particularly on two beautifully manicured golf courses, one located roughly North East and the other, North of Bangkok town. Most importantly, in the primary interests of our game, we carried with us a half set each, made up from our own golf clubs. Alighting in the Land of the Royal Orchid, we were struck at first by the orderly chaos of the traffic and the man-made splendour of the buildings surrounding us. At about 11am on that beautiful grey and overcast day, we called a regular cab from our hotel to get to the President Golf and Country Club situated an hour North East of Bangkok City by car. This is an idyllic setting, composed of four separate 9 hole – Par -36 golf courses, designed by Robert Trent Jones Jr. better known as the famous Bobby Jones himself! Today it is one of the Top 20 Golf Courses in Thailand and a real pleasure to play! For me, it was greatly gratifying, to be playing on a course designed by one of the best gentlemen golfers of all time and a true sportsman to boot. The courses lie North, South, East and West. One typically plays a Pre-set combination of two directions in a round of 18 holes – having said that, I must mention that there is absolutely no “criss-cross” and the other regular issues one faces, of shared greens and so on, since there is simply no space constraint there at all. I must heartily commend the Thai people, for their immense foresight in the matter of their wholly tourism dependent economy! My friend Mr Mathew and I first met Ms Ana, the lady who had kindly arranged the afternoon’s golf for us, then the caddies assigned to us, diminutive in stature and immensely respectful, their faces permanently creased in wide smiles (at us? for us? Or at their expectations of our state of play????). We were then introduced to our partners, Mr Khun and his son, Mr Ton. Bowing to each other to take the honour first we proceeded along to the North course for the first nine. A long straight par 5 with some wicked bunkers casually interspersed saw us through at bogey with our partners making par. The second, a lovely par 4, 349 yard hole with a slight dogleg right with a green guarded by water saw us home in doubles. Moving through the next few holes saw us through with a bunch of doubles with our partners playing steadily for par and bogey. We reached the lovely 6th – Par 3 across deep water with a tiny green. My simple advice is, always appease the Water Gods before taking on such a dauntingly difficult task! Need I really say any more? The 8th is a long par 4 with a pretty pine fringe on the left beyond the water bounding the fairway. A couple of bunkers strategically placed, added to the interest. The 9th is a long par 5, relatively straightforward but with a green well guarded on all sides by bunkers causing havoc for us and similar such members of the Duffers Golf Club! Part 2 will be Shankar and Mathew’s back nine at President. Stay tuned!